Facebook photo of Captn. and 1st Mate w/ the Kokanee. 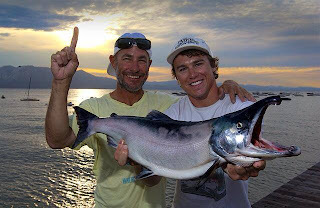 A 5 pound, 2 ounce Kokanee was caught last week in Lake Tahoe. Bill Bush caught the 2-foot-long fish on a lure at a depth of 67 feet near Baldwin Beach. 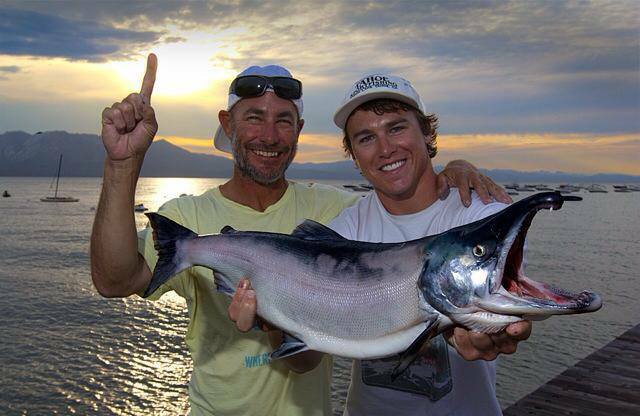 KCRA 3 is reporting this Kokanee as the largest ever caught in Lake Tahoe. The prior record was four decades ago when Dave Bournique caught one in 1973 that weighed 4 pounds, 13 ounces. The average Kokanee is less than a pound and a large one is 2 pounds. Kokanee salmon spawn on Taylor Creek in the fall. Many people visit Taylor Creek to watch the fall spawn. A Kokanee's natural food is plankton, but will take a variety of small baits and lures with light tackle. In January of this year a near record Brown trout was caught in Lake Tahoe, weighing 15 pounds, 9 ounces.